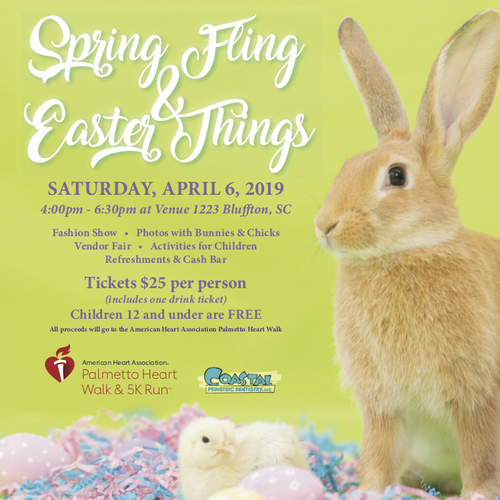 Coastal Pediatric Dentistry is partnering with the American Heart Association at Venue 1223 in Bluffton to honor the local heart trauma survivors in our community and fundraise for the Palmetto Heart Walk held in Shelter Cove Community Park on Hilton Head Island. Spring Fling & Easter Things is a family-fun extravaganza from 4:00 pm - 6:30 pm filled with activities for children, a silent auction, hors d'oeuvres, an opportunity to take family Easter photos with live bunnies and chicks, refreshments and bar with one free drink ticket for all the awesome parents and headlining a fashion show showcasing the crème de la crème of children’s and women’s apparel and accessories to raise money for a great cause. If you’re looking to get quality time with your family over good conversation, music, drinks, appetizers and entertainment, this is the event for you. Along with having a great time, you’re raising money for an even greater cause.